Sandra did 2 years of extensive research on the internet and had had several consultations with other surgeons before finding me. 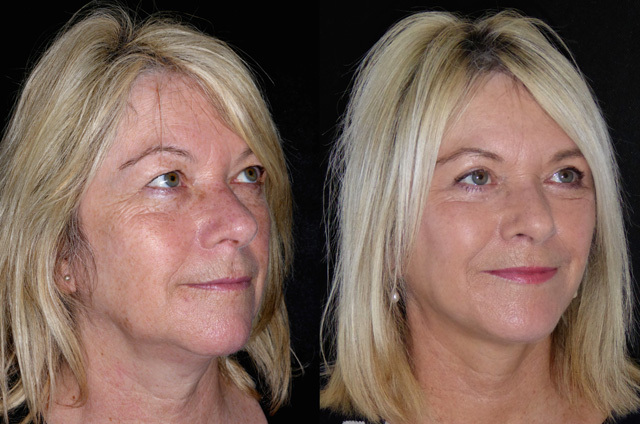 She was looking to achieve a fresher more natural look and with a history of corneal abrasions couldn’t take any risks with her eyelid surgery. She is a self confessed sun worshiper and ex smoker and this was showing on her face. 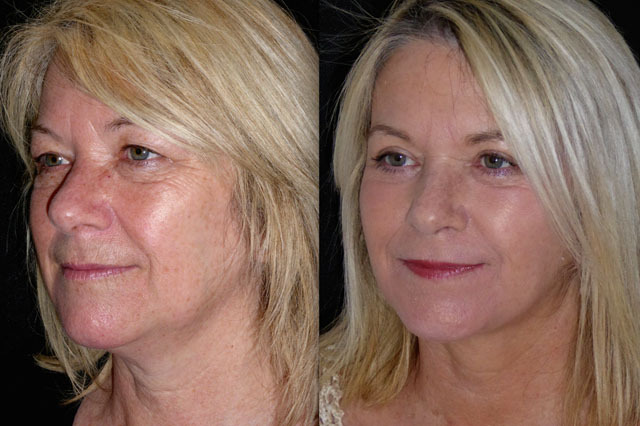 We planned upper and transconjunctival lower blepharoplasty, brow lift, face and neck lift and sub mental and jawline liposuction. 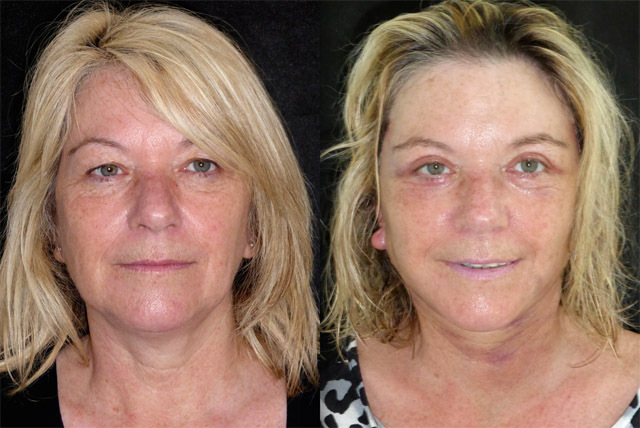 The Upper and lower eyelid surgery was completed 8 weeks before these photos, here is the story of her facial soft tissue work. 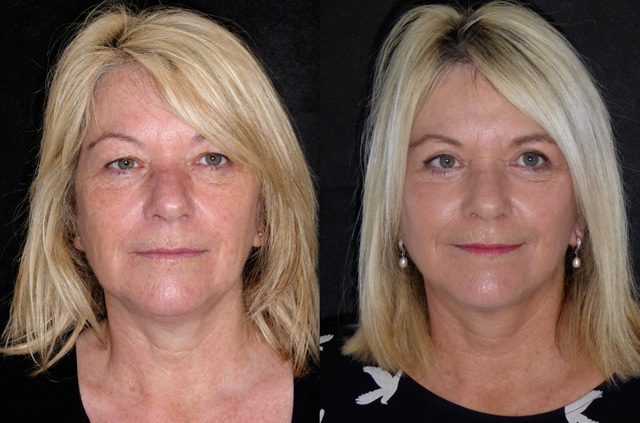 The morning after her Face and neck lift, brow lift and sub mental liposuction, Sandra is already looking great. Her facial soft tissue proportions are more balanced, the brow line more pleasing and her jawline is defined. The bruising (from the brow lift and liposuction) will come out over the next few days but she already has an idea of how she will look when this settles. The upper and lower eyelids have healed beautifully really giving a sparkle to her eyes. With her history of corneal abrasion, I chose to do this transconjunctivally (with no external incisions) to reduce the chance of corneal exposure from scarring. 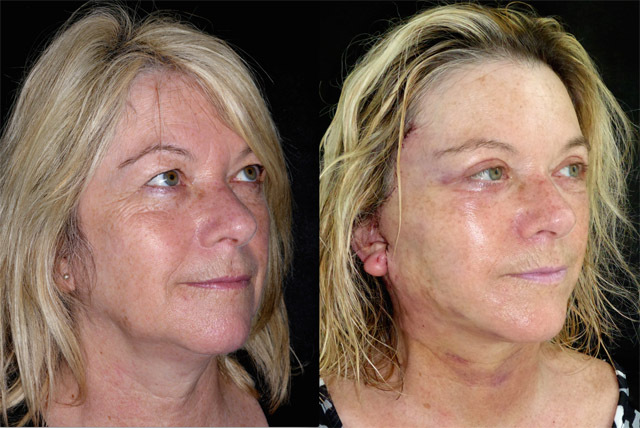 Here is Sandra on the day her stitches are removed a week after face and neck lift, brow lift and liposuction to her jowl, jawline and under chin. Bruising is settling but coverable with make up now and will be gone in a few days. She looks fresh, contoured and rejuvenated. 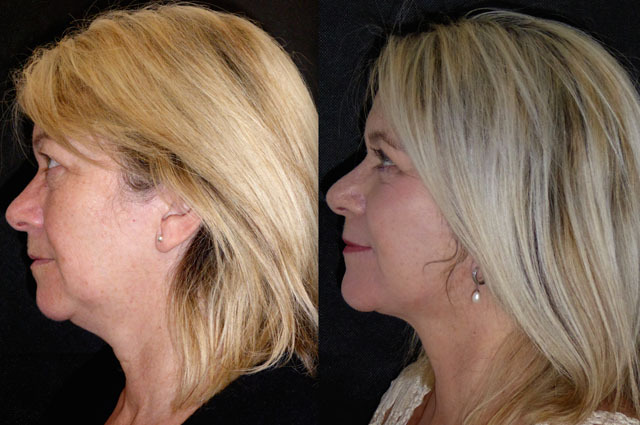 Her eyes are much clearer, jawline is really nicely delineated and the mid facial hollows that existed before have been filled with lifted jowl volume. She is going to have a lovely result. 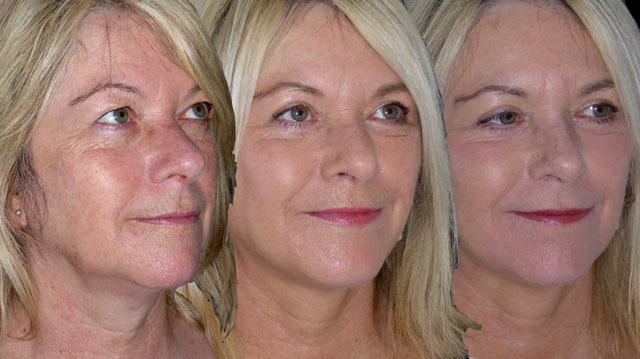 After her summer holiday we are going to treat her facial hyper pigmentation, perioral wrinkling and start a maintenance program to keep her looking great! Its so nice to see Sandra again, I haven’t seen her since her 4 week review. A year following surgery she looks incredible. Refreshed, balanced and natural. 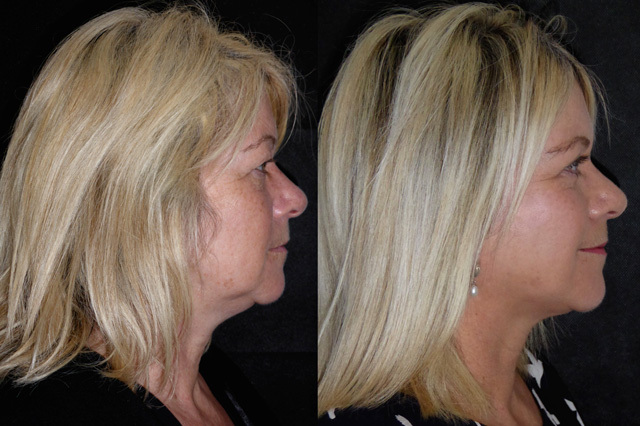 There has been very little relaxation of her face and neck lift and her jawline remains beautifully defined. Her eyes are beautifully framed and her skin looks so much healthier. 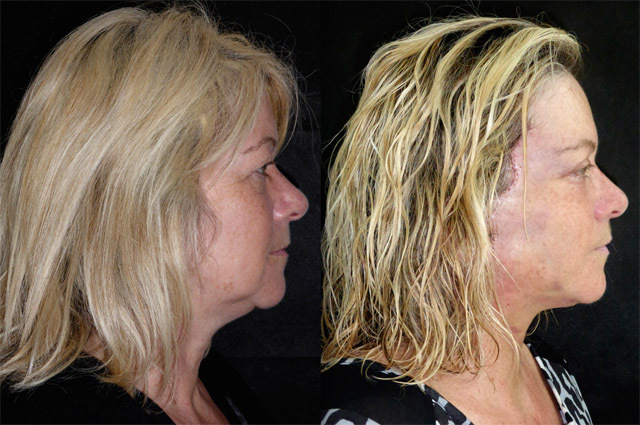 I am now going to resurface her whole face with fractionated CO2 laser to smooth out some fine wrinkles and improve her skin quality further. 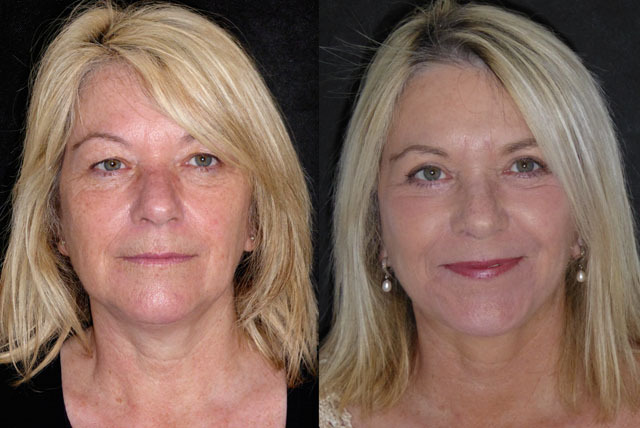 After full face CO2 fractional laser resurfacing Sandra’s skin looks even better. 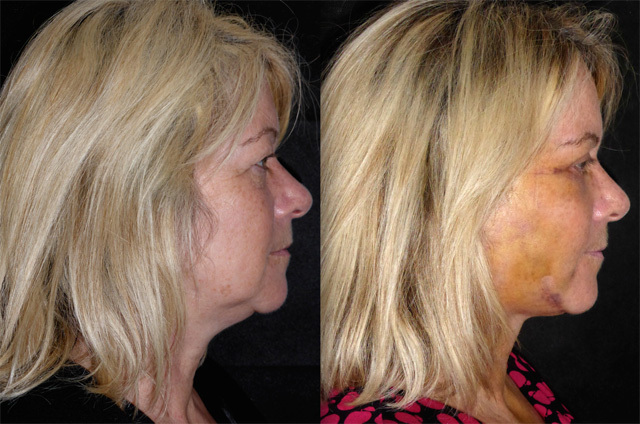 The deepest resurfacing was around her mouth and this area is visibly improved. 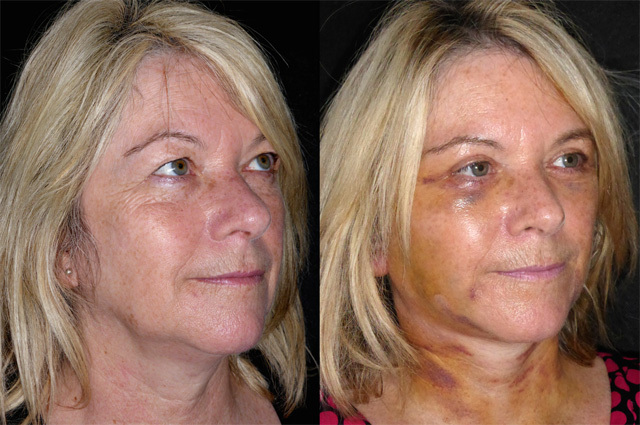 The results of skin resurfacing usually improve over months as the fresh skin settles and contracts. 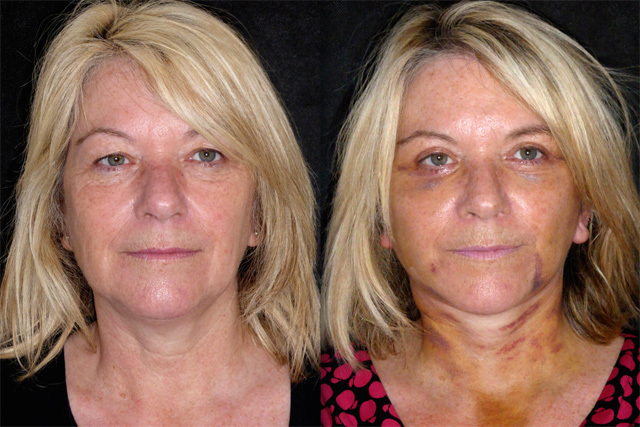 The photo below shows Sandra before any treatment then after surgery and lastly 10 days after laser resurfacing. Quite a journey but what a result!